What would your business look like if you set it up today? This reminded me so heavily of what I read in Financial Inclusion at the Bottom of the Pyramid. The book outlines how FinTech has taken off in third-world countries and emerging economies in ways that the US is still struggling to catch up with. Things like mobile payments were happening in the Philippines in the early 2000’s when I was still using MySpace and a hotmail address. My bank account wasn’t available on a PC nonetheless my flip phone. The reason it worked there was because there weren’t established systems. There were zero to few platforms to overhaul. The regulations that keep us as consumers safe from predatory practices within our current financial system didn’t yet exist in these countries because people didn’t traditionally bank. Traditional banks in the US have struggled to keep up in the age of tech. Things are improving, but it’s been a long, hard road, and there’s still room to do better. That company is Chime, and their mobile bank account does a lot. When you have a Chime bank account, you’ll wake up to a morning greeting telling you what your balance is. This helps you make good decisions throughout the day as you’re already conscious of where you money stands. And that’s just on the home screen. When you go into your transaction screen, not only can you see your transactions, but you can actually click on them to open them up in their respective apps. For example, you can click on an Amazon purchase and it will bring up what was included in that purchase. Another awesome thing you can do straight from the app is pay your bills. You can do this digitally, or, if you really need a paper check to do something like pay rent, you can draft it right from the app and they’ll mail it for you. When you write a check, the money will be automatically taken out, unlike the traditional method where the money is withdrawn when the recipient cashes it. Going out with friends? You can easily split the bill with them either via THEIR Chime account or by using Venmo within the Chime App itself. You can easily set up direct deposit from your phone, or get your routing and bank account number to fill out an ACH form with your employer. That’s why automation is so beautiful. You don’t even have to think about it. 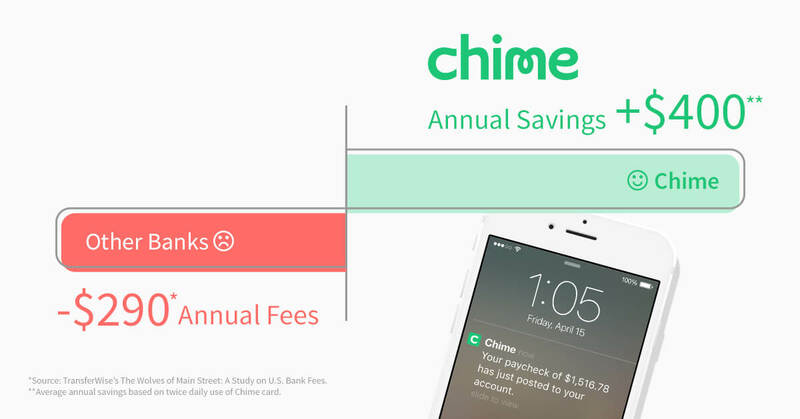 Chime does it for you, removing the temptation to spend. Speaking of savings, you also have the option of using “Round Up.” Every time you spend money using your Chime debit card, Chime will round up to the nearest dollar, transferring the difference to your savings. For example, let’s say you spend $1.07 on a pack of gum. Chime would round that up to $2.00, taking $0.93 from your checking and moving it into your savings account. When you open a Chime account, you’ll get an associated VISA debit card. Debit cards are different from prepaid cards. You have to load money onto prepaid cards, and they’re usually laden with fees. Debit cards link directly to your bank account, and don’t typically come with fees. 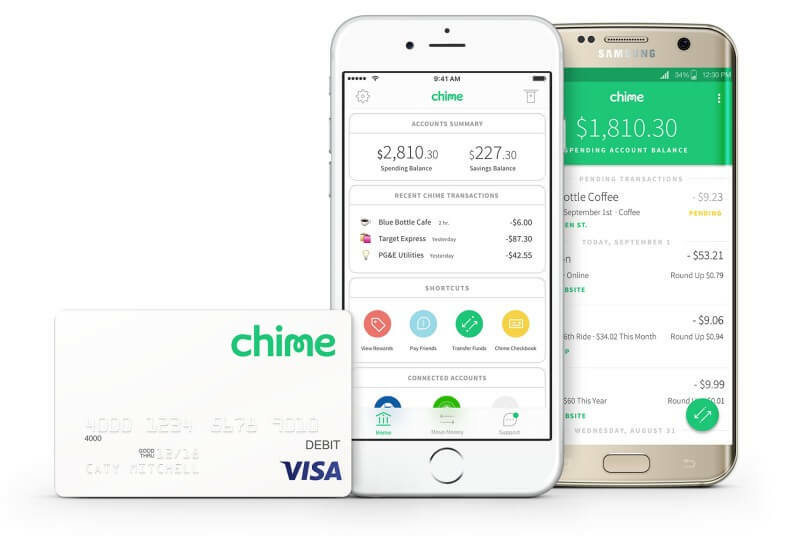 So with Chime, you’re getting a fee-free debit card that links directly to your bank account. No loading necessary. Every time you open a financial account, you should ask about fees and interest rates. Chime is no different. No overdraft fee. If you don’t have the money, you simply won’t be able to spend it. No fees when you use a MoneyPass ATM. There are over 24,000 across the US. You can find the one closest to you using the app, but if you want to look at that data now, you can do so here. You do have to pay a $2.50 fee every time you use an ATM that’s out of network. Honestly, though, a 24,000 ATM network is pretty darn huge. This is one area where you’re not going to get a lot from Chime. There is no interest on checking, and savings accounts only earn 0.01%. Chime doesn’t have joint accounts, so it’s not going to be awesome for couples who like having a shared pot. While I’m a big fan of separate finances, I know I’m not in the majority, so that’s something to take under consideration. If you’re single, or maintain separate finances, and rarely run into cash or paper checks, this could be a good option for you. While you can deposit cash at Green Dot locations, you can’t deposit paper checks. You could always go to a business that does cash checking and then take your cash to a Green Dot location, but there will be fees–and inconvenience–involved. UPDATE: Mobile deposit for paper checks is currently in beta for a subset of members. Chime is expecting to roll it out to everyone at the end of the year! If that profile sounds like you, this is a really good time to get an account. Right now through the end of June, you’ll get $5 just for trying Chime out. You do have to deposit at least $2 in order to get your $5 reward. The process is super easy and takes around five minutes. Are you happy with your current mobile banking options? What’s going right and what could use a little more disruption? We’d love to hear what you think in the comments! 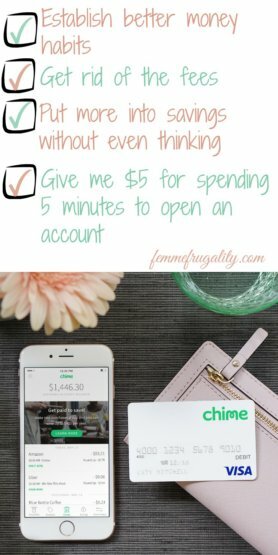 This entry was posted in Money Management, Ways to Save Money on June 14, 2017 by femmefrugality. Does Chime operate in Canada? or just the US? Hmmmm that is a great question. I’ll find out for you! Great overview of the benefits and drawbacks. It sounds like Chime could be a great solution for a lot of people. For me, being able to deposit paper checks with my smartphone and having a joint account are very important. My existing bank seems to satisfy my needs pretty well. I hear you! I have it on good authority that mobile check deposit is on its way! The joint accounts, though, mean this might not be the best for you. Getting a morning text with my account balance is awesome. I miss that about Digit. It really does help you make better decisions throughout your day. I didn’t want to invoke the name myself, but this feature, combined with “round up” makes it a great, free alternative. I love that Chime tells you your balance every morning. I think this is a great app for people who are beginning to learn how to manage money responsibly, in particular, though it has a ton of features that can benefit everyone. I am going to show my partner this, I think he would greatly benefit from having a more transparent bank. I think so, too–and so glad it could help! Let me know if he likes it!